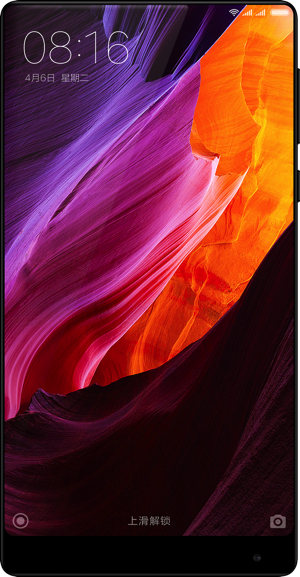 Xiaomi has today announced a new Android phablet branded as the Mi Mix, the world’s first edgeless-display handset. What this means is that the Mi Mix has a 91.3% screen-to-body ratio despite its 6.4-inch screen. Xiaomi calls it a “concept phone” (via The Verge). As you can see from the image inserted below, the only notable bezel is at the bottom of the handset. But there are other things that make this Mix smartphone noteworthy: The rear and its side buttons are made out of ceramic, the proximity sensor has been replaced by ultrasound, the earpiece with piezoelectric speaker uses the metal frame to generate sound, and the front-facing camera sits at the bottom. The phone was designed by French designer Philippe Starck (the same man who designed Steve Jobs’ yacht). In terms of tech specs, the Mi Mix incorporates the latest Snapdragon 821 chip to power the Google Pixel smartphone, 4 GB of RAM and an impressive 128 GB of storage. There will be another, high-end option, with 6 GB of RAM, 256 GB of internal storage, and 18-karat gold accepts around the camera and fingerprint sensor on the back. The low-end Xiaomi Mi Mix will retail for ¥3,499 (CAD$688), and the high-end, for ¥3,999 (CAD$786), when it launches on November 4 in China. The Mi Mix could serve as a concept phone for the iPhone 8 which is rumoured to feature an edge-to-edge display when it launches next year.